Unlike my previous summary, where I compared devices based on published information and third-party tests, I have the M10 and LS-10 in hand and have used both for some time in the real world. Not having the LS-11, I will assume it is identical to the LS-10, except for colour and those improvements the manufacturer has stated. First, let's have a look at the physical interface. You can click through the image here to view larger versions on my Flickr stream. 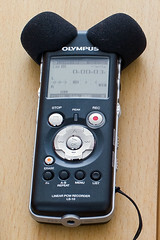 Olympus has long been a manufacturers of recorders for voice dictation and business markets. With the LS-10/11, they are taking on the musician and semi-pro audio market with a high quality series of recorders. The device is designed to be easily used in one hand. Controls are well-placed and responsive. There is enough separation between them to ensure they are all easy to find with the thumb. Definitive clicks indicate activation. A large peak light sits front and centre. The Record button is rimmed with a light that is impossible to miss. It takes one push of the button to go into record standby and a second push to initiate recording. Easy! On the left-hand side is a socket for your headphones, a knurled volume dial that will not turn accidentally and a power slider that you must hold for a second or two to activate. Sliding this the other way turns on the Hold feature. A well-protected USB socket and SD card slot complete the profile. On the right-hand side (picture below) we find sockets for line in and microphone, a record level knob and sliders for input sensitivity and low-cut filter. On the bottom is a socket for AC power. On the back is a tripod mount and the speakers. These are useful only to quickly confirm that you have a signal; use headphones to listen properly. On top of the unit, between the microphones, is a socket for a remote control. The Sony PCM-M10 is the latest in a long line of digital recorders from that manufacturer, who paved the way with MiniDisc units of surprisingly high quality some years ago. This is the third in their line of solid state portable recorders, and is the smallest so far. 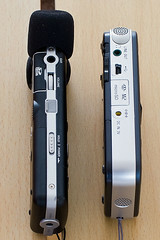 As you can see from the side-by-side comparison (top photo), the Sony is not as long as the Olympus but more chunky. Though you can hold it in one hand it feels more likely to slip away from you. The circular buttons are recessed and provide good tactile feedback. They are illuminated in use, which is a slick touch. The line of buttons above these are somewhat clunky to use, as they have no space between them and require a very firm press. Instead of a compass arrangement, Sony has chosen to have three of the round buttons double as navigation controls. This is less "intuitive" than the Olympus. To enter record standby one presses the Rec button. To begin recording, press Play. The pause button will now flash. While this may be similar to how cassette decks used to work, the Olympus system is much simpler, requiring one button and not three. On the left-hand side of the unit lies the line/headphone socket, USB socket (no cover, unfortunately), micro-SD / M2 card slot and AC power socket. Just below these, facing onto the back panel, is a speed control switch and the output volume rocker. While easy enough to use with the thumb, I prefer a dial, so one has better control and can see the setting. Otherwise one could have the level cranked from listening to the speakers and then plug in headphones -- ouch! On the left-hand side is a large record level dial, the power/hold switch and a socket for the remote control. I believe Sony includes this with the unit in all markets. (It's pictured in the top photo for scale.) Below these, again facing onto the back side, is the sensitivity switch and a switch for manual or automatic record level. I am not fond of the way these controls lie on the bottom edge of the recorder. The bottom of the unit is home to the speaker. The back also has the battery compartment and tripod socket. The top of the unit has sockets for line in and microphone in. Again, I prefer the LS-10 in this regard. The top of the recorder, between the microphones, is the least convenient place for access. I prefer that something infrequently used be here, rather than mic in, which I use all the time. That said, I see Sony's logic. If you are using mic in, you do not care about the internal microphones, so it's OK to fiddle around in their vicinity. The LCD panel on the Sony is bigger and seems to display more useful information. But I have had no problem using either. In fact I often wish for a display mode that would convey less information, so I can focus on what is critical during recording. Holding down Stop on the Olympus transforms the display mode momentarily. But this is obviously not useful when recording, as it would stop that process! The Display button on the Sony only changes the date/time part of the LCD. I would like multiple display modes that are easy to cycle between. Why not a display filled with the record levels? Or another with only track info? Or even a frequency analysis? Even MP3 players have features like these. The Sony has independent LEDs for each microphone that indicate a -12dB signal and a positive ("over") signal. I like having separate channel indicators in theory, but as one cannot adjust left and right input channels independently (a limitation of both units) it is not that field relevant. In fact the central positioning and larger dimensions of the Olympus light makes it more practical. It lights an unmissable red for OVER. If it lit green at -12dB it would be the best of both worlds. To summarise: the overall fit and finish of the Sony is good, much better than the Edirol, Zoom and other cheaper makes I have used in the past. But it is no match for the Olympus, which I prefer even to my Fostex FR-2LE. The Sony power switch, a wobbly bit of plastic, is particularly worrisome. The LS-10 switch is also plastic, but much firmer. Still, this is one place Olympus could improve their unit. The difference in the functionality of the provided controls is minimal. If you really need an external switch for auto record level, you need the Sony. If you prefer to have low-cut on hand, get the Olympus. Not that these should be your main decision points! The LS-10 menu system is dead simple to use by way of the compass control. It is clear and well organised into groups. You can cursor left to move between the groups or just cursor down through the lot. This is easier to do than to describe. The Sony menu is a confusing linear list. Hidden in the many options is a "Detail Menu" that contains a further sub-menu of choices. Several of its options might need to be accessed regularly; having them buried here is a pain. Sony need to improve this aspect of usability. Both units provide quick access to repeat mode, a rather useless function for our purposes. Both also have buttons for the menu, folder access and erasing a track. The Sony has a dedicated track mark button but the LS-10 does not have this feature, an oversight corrected on the LS-11. Finally, the Olympus has a convenient "Fn" button to which you can assign various functions, depending on which one you need to use the most. I think all recorders should provide this level of customisation. Both units run off two AA cells in easy-to-access compartments on the back. I use rechargables and get good battery life. In fact, this is one area in which the technology has advanced to an amazing degree. The LS-10 is rated for 12 hours, a claim I have not tested. But since it is easy to carry a spare set I have never been caught short. However, when I first started using the Sony I forgot it had batteries at all! I used it day-to-day for a couple of weeks before the indicator dropped a notch. Officially it is rated at 24 hours when recording CD quality. But it's easier just to say "it's magic". 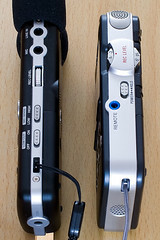 The Olympus LS-11 has a similar official figure, which I no longer doubt. All units have a peak limiter (digital realm) that works very well. I have done many recordings that occasionally peaked out -- the resulting files are totally usable with no distortion. Of course an analogue stage limiter would be even better, but I do not expect that feature at this price point. The LS-10 has 2GB internal memory and takes handy SD cards up to 8 GB, but you need to specify in the menu which you are recording to. The LS-10 has 8GB internal, supports SD up to 32 GB and lets you move files between memory locations. The M10 has 4GB and will record "cross-memory" between the two locations... nice! All units operate as mass storage devices. All power on and are ready for use promptly. However, this delay will lengthen when using large storage cards. The Olympus has a "zoom mic" feature, built in reverb and something called "euphony"; the Sony has the aforementioned speed control, pitch shift and bass boost. I don't care for any of these DSP tricks. But oddly, though both devices function as MP3 players, neither has a proper EQ control, something I would take for granted on a dedicated MP3 player. Each brand provides one useful "bonus" feature. The LS-10 (sorry -- available on the LS-11 only) has what they call "Voice Synchronization", which is simply sound-activated recording. Once the input level gets high enough, recording starts. The M10 has a five second pre-record buffer, which can be terribly useful in situations where you are waiting for a particular sonic event, say a bird call. Wait for the bird to chirp and then press record. It's like having your own personal time machine. The LS-10 and LS-11 have cardioid microphones angled 45 degrees from the centre axis. These are perfectly decent in frequency response and noise floor for low-demand applications like street interviews or getting a quick recording of a band. The unit comes with custom foam shields to help keep out wind noise. Though I mentioned above that the Olympus feels better in the hand, always use a tripod if you can, since these units are notorious for picking up handling noise. The M10 has omni microphones, which results in them being less directional, with a rather poor sound stage, but significantly lower noise floor (spec says 17 dB(A)). In practice I have found that when targeting a point sound source (eg interviews) the subject sounds distant and background noises can become objectionably intrusive. But for ambience these mics are superior to those on the Olympus. Of course, if you are serious about recording you will be using external microphones. Both these units have a stereo mini socket with plug-in power (PIP) to fuel electrets. If you use more demanding condensers you will need to power them from their own internal batteries or an external battery pack. In independent tests (by Avisoft Bioacoustics) the microphone pre-amps on these units, in the best case scenario, have identical EIN noise figures of -122 dB(A). That is a remarkably good spec. In practice, however, the frequency characteristics of the noise might make one unit more or less objectionable. This also depends on the noise floor of the microphone you have chosen as well as their sensitivity and other factors. I have not done extensive tests but find both units entirely usable. The LS-10 can record in WAV, WMA or MP3 formats at a range of rates up to 96KHz 24-bit. The Sony does not support WMA but provides lower quality standards, namely 64kbps MP3 and 22KHz 16-bit PCM, perhaps useful for when you are trying to cram a lot in memory. The LS-10 has 64kbps in their WMA options, but no PCM format as low as 22/16. Only the LS-11 provides mono recording, a useful feature that effectively doubles available recording space. I would like to see FLAC support in these units, so as to increase recording time with no audio compromise. If you need to record continuously for long periods of time, the "seamless file" feature is important. Otherwise, once the file reaches the WAV/FAT file limit size of 2GB/4GB, recording might stop or even be corrupted. The Olympus LS-10 has supported seamless recording as of firmware 1.10. I assume that the M10 also has this support, since the previous Sony models did (but I have not tested). The recorder will then automatically save the first file and open a new one, continuing to record with no loss of data. Tracks are automatically named with the date and time on the Sony unit but are given arbitrary numbers on the LS-10, an unfortunate and annoying choice. On both units the LEDs and display can be turned off (independently), for times when lights would be disruptive or stealth recording is called for. If you are running low on space the record light on the Olympus units starts flashing a warning. When you plug a mic into the Sony, it asks you if you want plug-in power turned on. Both great ideas! By comparison, the Sony mic is down only 3dB at 40Hz, according to their own chart. And their input is not reputed to have this limitation. Does this matter? Well, maybe not as much as it might appear. It depends on what you are attempting to record. A piano or orchestral piece might sound weak. Birdsong would be unaffected. For what it's worth I have used the LS-10 successfully to gather material for my electroacoustic compositions with no issues. But that is because I use a larger and more professional rig when ultimate sound quality is a priority. I don't expect too much out of a hand-held recorder. Furthermore, a German listening test (Google translation) found the LS-11 to be one of the best recorders in their batch. Intriguingly the LS-10 was not rated so highly, so perhaps the sound improvements Olympus claims in the new model are definitive in the real world. Certainly 60Hz more bass extension is a real benefit, but it is not enough. I hereby call on Olympus to fix this problem once and for all. All units come with a USB cable, hand strap, and two batteries to get you started. I recommend Eneloop rechargeables and a good charger. Cheap mini tripods can be found for a fiver and are very handy. The M10 is provided with an AC power adapter (120V only) and wired remote control. On disc is a copy of Sound Forge Audio Studio LE, editing software which is capable but sometimes quirky (baulking at perfectly good files, for example). An essential wind screen is a $50 extra. A carrying case is $30. The Olympus units come with a foam wind screen; a fluffy "Windjammer" is an optional $50 accessory. A wired remote comes with the unit in Europe but in North America it's a $60 option. Cubase LE4 is provided on disk, which can be good value for anyone needing a multi-track recorder. But it's maybe not the best choice for stereo editing. In both cases the software is Windows-only, so users of other operating systems are left without freebies. I now list the main benefits and features of these units. Prices are retail. Olympus have given us an object lesson in how to design an interface. Their units, made of aluminum, are solid and have excellent fit and finish, better than some professional gear. With the LS-11 they have corrected some omissions (track mark) and provide so much internal memory one may never need the SD slot. The interface is dead easy to use and responsive. The fact it has cardioid microphones make it a better choice for voice recording or any other directional application. And if you need sound-activation or mono recording, it's the only game in town. The low-end response is the Achilles heel, but it still rates well in listening tests. The Sony M10 has microphones with the lowest self-noise of any portable recorder and so is the recorder best suited for phonography. However, this matters less than one might think, since in these cases most recordists would be using external mics. The pre-amps rate the same as the Olympus but are said to be better in practice, which will matter if you have pro microphones with very low self-noise. It has decent build quality and sufficient memory for many situations. If you add a micro-SD card, the ability to seamlessly use both locations is a boon. The pre-record buffer is the killer feature for certain applications. Thank you for this great comparison! I have the M10 and can agree the interface is confusing and awkward. Always a pleasure reading your reviews. Very thorough; fair and balanced. Thank you for featuring our LS-10/11 units. Thanks for the comprehensive user's comparison. I have the LS-10, and I find it very, very useful. I used minidisc and Hi-MD recorders in the past and the ease of use is great. If the Olympus runs out of power when recording a file, the entire file is lost. All of my MD recorders would conclude the file before switching off. Does the Sony conclude and save the file if the power runs out during recording? Olympus: Glad you are reading and hopefully taking notes! ;-) A lot of simple things could be fixed with a firmware update, perhaps (date-stamped file names, for example). Anon: Good question. I know the Olympus saves a file if it runs out of disk space but I have never had either recorder run out of battery in the middle of a recording. There one major problems with both the LS-10 and LS-11 you didn't mention regarding the microphone input. The bass roll off that is present with the LS-10/11 internal mics is also "built in" to the microphone preamp of the Olympus units. Thus even if you plug in a mic that is flat down to 10Hz you will still get 6db per octave roll off which is almost 30db down at 20hz. There is no way to bypass this without using an external preamp. This makes the the Olympus useless for any critical recording application even with external mics. If you are looking for full frequency reproduction the Sony PCM-M10 is the only choice. One additional PRO that the Sony has is that its inputs (mic and line) are very resistant to overloading. The M10 will take a 4db (2V peak) full professional line signal without clipping. The Olympus will only accepts consumer -10dbV (0.447V peak). This makes the Sony very easy to use with professional studio equipment. violinbf: In fact I did mention quite specifically that the mic input on the LS-10 "rolls off the bass at about 6dB per octave". This does not make it "useless" however, since many sources do not have usable content below that frequency. But I agree it does severely limit the applications to which you would want to put this recorder. A very useful review and comparison. For some reason Olympus made the LS-10 to have very low Line-in sensitivity compared to other handheld digital recorders, which is a minor problem for anyone using an external preamp. Despite Aivsoft's figures, I have found the noise floor on the LS-10 to be noticeably higher than with the Edirol R09-HR, which despite its poorer build quality, is a nicer-sounding recorder imo. Very nice reviews and comparisons you've been doing. Thanks a lot. I'm looking for a handheld unit and have found your articles to be the most helpful of all. It is not true about the battery dying aspect of the LS10. I routinely leave mine running all night somewhere and enjoy the dawn choruses that recorded, once I add fresh batteries. Great review! Unfortunately my 3rd LS10 is going back for a dead internal mic channel. The LS-11 can only record a file 4 gb in size. Then the recording stops. Whereas the M-10 allows you to fill the complete 4 gb internal and 16 gb external card. Thanks Stan for emphasising that point. I did mention the "cross-memory" recording feature on the Sony. It's handy if you need many hours of uninterrupted recording, though that's likely to be a minority concern. Thank you for such great reviews.SO informative. I am still on the fence about Olympus LS-10 or 11 or Sony M10 or Sony PCM-D50. I will use for recording a band I am in with alot of percussion, bird sounds in nature for a children's project I am doing as well as other musical recordings which I may want to ownload to my i-tunes. I am willing to pay for a superior product. I may be doing all this in the dark and wonder which of these have a light up display and which is best compatible with a MAC. ? OS Compatibility: These are "USB 2.0 Mass Storage Class Devices" and hence are recognised by Mac OS and other operating systems. The only limitation would be that the bundled software is for Windows only, but this is not necessary to use the recorders. You can check the manufacturers' sites for more specific info, though often they might say they support a more limited subset of operating system versions than they in fact do. 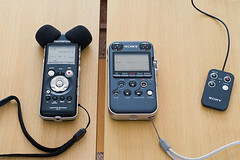 Suitability for different sources: Both recorders are quite capable for recording a wide variety of sound sources. They have a high sensitivity setting for quiet sounds and low sensitivity for a band or other loud sounds. Sound quality is (in all except extreme situations) not limited by the recorder but rather by your microphone selection. LCD screens: Both units have decent screens, much better than on older recorders I have used. The M10 allows you to set the back-light to be always off or on, plus timed settings of 10 and 60 seconds. The LS-10/11 also has settings for 5 and 30 seconds. While the M10 screen is reflective it is still readable in light. Mind you, my eyesight is a bit bonkers so I am not the best judge of this. I read multiple reviews and searched manufacturer's websites but didn't find everything I needed to know until I found your review. Thanks for all the info, particularly comparing the bass rolloff. Thanks so much for sharing this very informative review! I really appreciated finding such resources when I'm trying to make my choice. I am an ornithologist working in a tropical rainforest, and currently I'm looking for a good recorder to try to record the bird calls as I do my bird census. I probably should be able to get an idea from what you have written, but still I'd like to hear your comments on these two models regarding this specific application - if the focus is to be able to identify the different bird calls (hence the bird species that gives the calls) from the recordings, which model would you give more preference to? It would be difficult for me to recommend a unit for a specific application I have not tried. It would seem to me that the microphone you use would have more impact than the recorder itself. Do you plan on using some sort of parabolic dish so you can more accurately pinpoint calls? Thanks Robin for your response! As of now, I'm not planning on using such an external device (mostly due to portability issues) - but I'm not against this idea if it is necessary/highly recommended. Given this, could you give me some comments? Thanks so much! You are limited with the built-in mics. By their very nature, both will capture best the sounds immediately around the recorder. Though the Olympus is more directional, most would recommend you get external microphone(s) to suit your purpose. If you want to be able to hone in on sounds you hear, pointing a microphone at the target, then you could do well with the Sennheiser ME66 supercardioid, which requires the K6 power module. This can run off a battery, so you have nothing else to carry. But even for this moderately priced mic you will be paying significantly more than the recorder. A good resource for you would be the Nature Recordists Yahoo group. Thanks Robin for your comments and great help! That has been quite helpful. I'm heading for the forest soon, and for this time, I guess I'll try using just the recorder and see how things go - and will explore the external mics more later. Thanks so much! And following on Blue Robbin's and your discussion, I already have the K6/ME 66 and wonder which of the 2 recorders, the Sony M 10 or the Olympus LS 11 would best interface with it in the field to record bird songs. I really like the sound recorded with the M10 (that's the one of the three I prefer actually), but as it seems very different from that of the D50, I'm wondering if it's not a distortion of reality (it seems to lack brightness in the middle range). I have addressed some of these concerns in a new article. When I listened to the recordings I preferred the LS-11 to the M10, but I am sure that is the microphone. The M10 sounded "boxier" to me, less forceful. But as I discuss in the article, it is difficult to make conclusions from those recordings. Would you recommend the Olympus LS-11 for recording DJ sets off a mixer? Or which digital recorder would be best for this purpose? I think most DJ mixers operate at -10dBV so you could plug the Olympus straight in. However, if you take the output of a professional (studio) mixer that operates at +4dBV you might overload the inputs unless you turn the output on the console (assuming the outs you are using have an attenuator) way down. AMAZING GOOD review Robin, thanks!.. I plan to use one of these recorders with an external shotgun Sennheiser K6 ME67 to record birds... I was just wondering about the MANUAL REC LEVEL of the Sony unit: does this wheel works as well with the external mic as it does with the built-in mics?... I guess you will use the whell based on the meter shown in the screen WHILE recording, right?.. I am more for the Sony one but would love to hear from you before deciding!.. Yes, sure, the record level attenuates either the built-in mics or the input signal of anything plugged into the mic in socket. Is that what you mean? Which recorder is easier to use? I had a Zoom H2 that was a bit complicated, but I was able to figure it out. I lost it and replaced it with an H4 which I got rid of because I couldn't figure it out. I hear some reviews saying thee Sony is easy to sue and others saying it isn't. Has anybody found or cobbled-up an external battery pack for LS-10? For example, how about a pair of D-cells and wires to dummy AAs...as is done sometimes for Vivitar flashguns....? Would require a small hole in the battery lid for the wires. Other, slicker solutions? I do run out of battery frequently. I find the Olympus slightly easier to use since the menu is organised and the buttons more intuitive. But that said they both are quite simple devices once you have your settings the way you want them. Likely they are simpler than multi-channel (>2) recorders or those that overdub etc. I like your review and comments from readers. Which one would you recommend for recording a choir usually numbering 50 - 60 singers? I currently use a Sony Hi-MD MZ-RH1 minidisc with the Sony ECM MS907 mic, but would like something a bit better, sound quality-wise without the hassle of going to a multi-track recorder with multiple mics. I'm considering getting an Olympus LS-11, a Sony PCM M10 or a Yamaha pocketrak W24. Welcome, Paul! You have given me the opportunity to emphasise once again that to get better quality, get better microphones. And use better microphone techniques, including positioning. In your case, a coincident pair of cardioids placed above the choir might work out very nicely. You can also experiment with a spaced pair. Such recordings have been done since the dawn of time and every European broadcast institution seems to have their own protocol. One of the newer flash recorders will not give you better sound quality than a Sony Hi-MD. Even if they can record at a higher sampling rate than 44.1KHz, and at greater bit depth than 16, this is only of relevence if the signal they are being fed needs more ones and zeroes to capture the information accurately. And that will not be true unless you are using top of the line mics. Though the flash recorders might be easier to use and more convenient, especially when it comes to loading the results onto a computer. Your best investment is in microphones plus the stands to hold them, the cables to attach them and the phantom to power them. If you must use the built-in mics of a flash unit, be sure to use the screw mount to attach it to a stand so the mics are positioned appropriately. A remote will then be essential to control the recorder, as it will likely be out of arm's reach. Either the M10 or LS-11 will do just fine, depending on mic positioning. The M10 has a wider placement of omni mics and so will pick up more room sound. It may need to be placed closer to the singers. But that depends on how nice the room is and how much reverb you want to colour the recording. Robin, many thanks for your advice. Because live recordings need to be unobtrusive, I think I will go for the Olympus LS-11 with built in mics, mounted on a tripod, and consider external mics later on. very well written review, i used this review to base my latest recorder purchase off of - 10 olympus ls-10s. one question i have is that this is the only place (the olympus manual included) that i have seen anything about the ls-10 having voice activated recording. i'm very interested in finding out how to set this up. Nick, good catch! That feature is available on the LS-11 but not the LS-10. I have updated the article to correct this mistake. I have not found a review of the Auto level functions. This feature is taken for granted and is required for general speech, conference, and casual recording where lower volume sources vary unexpectedly from whisper to casual conversation levels with occasional spikes from ambient activities. I bought a PCM-M10 expecting its AGC to be at least as good as my aging low cost Olympus WS series recorder. To my dismay, the M10 records low to medium sources at an unbelievably low -30db to -24db. I confirmed this in my Sound Forge Pro 10 editor after extensive testing. I had to zoom the scale very far to see the signal. It is nearly inaudible on PC's at normal volume levels so you can't share or submit the file to others. I could edit and boost the waveform to -12 to -6db but that destroys the quailty. E.G., talking 6" from the mics in a normal voice ends up at -24 to -30db and doesn't light the Green OK level lights (-12db). Sony Pro support also thought it was too low but admitted they hadn't investigated the Auto function. So, I exchanged the unit for another one and it, too, did the the same. 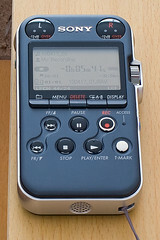 Without an effective AGC, you cannot use the unit for many dynamic level situations, like conferences, interviews, notes, friends talking, family gatherings, quiet music like harp, or any other situation where it is incovenient, infeasible, or unprofessional to stop and play with manual mode and setting the recording levels. Since Manual control with level=5 gives a wonderfully strong recording level in the same situations, it is clear there the amps can do what is needed. So it suggests there is a fatal design error regarding the AGC or lack therof. In fact, setting Auto is almost the same as setting Mode=Manual, Level=5 and Mic=Low. IOW, it is useless for many common low-moderate volume scenarios. That is 60% of my needs. Of course, if all you record is medium to loud events, like bands, parties, orchestras, etc, then Auto may work for you since it seems as if the mode can reduce strong source levels but only mildly amplify lower level sources to a useless -30 to -24db level. Any thoughts? Does the LS-11 have a truly effective Auto (AGC) function like in its speech recorders that will boost low signals as much as manual mode can? I didn't mention it in every article, but my coverage of these recorders is related to my activities as a phonographer and sound artist. As such I would never use AGC. Nonetheless I am surprised Sony screwed up AGC. I would hope Olympus did better, since they made their name in dictation machines. Anyone else have experience with this? Hello,Could someone help me to decide between the M10 and the LS-10 or maybe LS-11.The point is that i need the divice to record violin playing,so i need a qualitative and professional sound,so which device is more suitable for this purpose.Nevertheless Sony M10 is a bit expensive.Thanks in advance. The LS 10 has a range of 70Hz - 20kHz and the LS-11 has a range of 60Hz - 20kHz. Wingfieldaudio.com is a widely respectable source known to many for their tests. In short they tested the several audio devices with the Sony PCM-D1 scoring the highest. With this in mind, that being the Sony PCM-D1 being the highest quality audio to the real source that has created it, it can be used as a benchmark against other recorders. In my Opinion, I have been using the Olympus LS11 and am extremely happy with, so much so that I have sold my Tascam equipment and have been using this as my portable in-field recorder for my specific application needs. Thanks for the references and your thoughts on these devices. I have long kept an eye on Wingfield Audio but find their short voice samples less than ideal for discerning differences in full-scale spectra. Not that my little tests are any better! The German article referenced in the thread you noted is here in English translation. They do a great job of providing a variety of recordings with each unit, but unfortunately do not have a top-end baseline, something like a SoundDevices. More to the point, they do not test the Sony M10. I could not find any definitive reference for the improved LS11 low end, without which a claim of an extra 10Hz doesn't mean too much. My name is Hugo I'm a sound designer, I decided to buy a PCM-M10 because i wanna start to build my own sound library. I'm very happy with them-1 overall performance, today i decided to record a hollywood quiet background ambiance close sunset, i've set the m-10 to record at 96khz 24bits, manual rec level, low cut filter enable and hi sensitivity pattern selected. I've noticed some distortion in some real calm sounds, and i'm pretty sure that my levels didn't clip, i can't figure out what's wrong. Great review -- thanks. I just sold my Sony PCM-D1 and purchased the LS-11. I like the size and convenience of the Olympus, and didn't need the pro-audio features of the Sony. Also, I was able to sell the Sony for more than $1000 after owning it for five years! The quality and performance of that unit are impeccable, though. Wonderfully detailed review and follow-ups, outstanding! I have just started phonography, and am nature recording at the moment. I have some experience with a borrowed M10 and am really impressed with the internal mics, specifically how quiet they are when recording in the forest at night - do you think the LS-11 would be as quiet using the internals? My guess is no, because of the cardioid mics, but what's your opinion on ultimate self-noise/noise floor, if these are the correct terms? Also I've got a tip. In Europe, the Olympus LS-5, available as of late last year, is a fair bit cheaper than the LS-11 despite being identical in all technical aspects. The 5 just has less on-board memory, but as both are extendable with SD memory, buying the 5 represents a massive bargain. Daniel: Those are indeed the correct terms and the M10 comes out ahead with their internal mics. Thus if phonography of faint sources with internal mics only is the main priority, the Sony is the recorder to get. However, most who engage in that pursuit end up using external mics, and in that case the recorders are very similar, since their pre-amps have the same self-noise figures. External mics are not only beneficial in terms of sound quality but -- and this is key -- microphone placement. I prefer keeping the recorder in a large pocket or on my belt, placing the microphone itself closer to the sound source, or in a binaural position for ambience. Handling noise becomes a non-issue when setting up the recorder, checking settings, etc., since the mics are distanced from the unit. Good call on the LS-5 which I keep meaning to write an article about. Buying this saves 100 Euros off the top LS-11 price of 275 (at one large online retailer). Note that besides the limitation of 2GB versus 8GB it also omits the remote control, protective cover and the copy of Cubase LE (replacing it with Olympus's own Sonority). Only the first of those is a big deal, IMO. As far as I know the units themselves are identical, though I have not seen confirmation of the pre-amp specs. Hello, great source of information here and on the strength of it I have recently purchased the LS-11. As it is my first recorder I am curious as to what kind of recording level I should be getting and am wondering what others might be achieving with the same settings. When recording speech with the built in mics. about 4" from the source in manual (level 10), mic sense on low, I'm getting around -18db to -6db. In auto I'm only getting -30db to -18db, although this does improve significantly with the mic sense on high, as it also does when recording in manual where I only need to set it to level 4 to achieve the same level of recording that I was getting with mic sense on low and the level set to 10. I get similar levels when using a Rode NTG2 mic, although slightly lower. I note that the manual states that the mic sense set to low is the standard level of mic sensitivity and so should be turned on to record speech but I am surprised at the low recording levels I'm getting when it is on. Obviously when on high it will be picking up background noise. Any thoughts on this would be appreciated -thanks. Great review and great site. My wife is an anthropologist and am looking for a very small but very capable field recorder that can serve double-duty as a field recorder for interviews and recording group interactions (she is a linguistic anthropologist and so analyzes how cultures use language, especially in groups) and also as dictation recorder for later transcription with NaturallySpeaking. Is this too much for one machine to do? I was considering getting the Olympus LS-11. It seems that it would be great for the field recording/interviews but I was wondering if set to mono and used to dictate at close distance it would produce good results. Is there another device that would better fit the bill? Within reason, price is not a major consideration. what is important is size and durability and, of course recording quality. She already has a sony pcm-d50 and it is just too big for some of her very remote work. Anon: I think the Olympus would be perfect. My wife and I have both used it to record student work in class, for example. I haven't tried feeding the results directly into a voice recognition system, since I don't currently use one, but I see no reason it wouldn't work at least as well as any other unit. Save money with the LS-5 and buy SD cards if you need them. It's handier to backup work that way in any case. Vincent: I have no specific answer to your question of recording levels but have always been able to get some appropriate signal. Vincent, I've found (with LS10)the zoom mic setting works very well to reduce background noise. I visualize zoom setting recording mostly (empathizing) a 45-degree pie-shaped audio field, diminishing the rest. In other words, it generally reduces noise from sources outside those 45-degrees. Intriguing! To be honest I have not used the zoom feature after my initial experiments. Thanks for the suggestion. Robin OOPS...I mispoke. I don't use the "zoom" setting for that purpose, I use the next wider "narrow" setting (between "zoom" and "standard." Testing, I found the "zoom" setting didn't serve my purposes. If I aimed a performer who relied on microphone and PA system I was making a mistake because the sound didn't come from the performer, it came from the speakers. As well, the "zoom" setting assumes you can aim pretty well, which I can't count on in a performance space. IF recording distance was very little maybe the "zoom" setting would be good because it would probably ignore most of the background noise. In a crowded performance space with good sound system, maybe the trick would be to be close to the speakers and zoom at them. I have had the Olympus LS 10 for three years now and am very happy. I sing in a band and we use it to record practice sessions and live performances. I don't use it in 24 bit mode as I find the sound quality in the best WMA mode crystal clear anyway and this mode is compatible with my software to make CD's. I also use it as playback device and connect it to my PA system to play backing tracks when i am performing solo without the band. The only improvement i can suggest is more of a warning when your batteries go flat, because it happens suddenly. Maybe a small meter with a low level light on the screen. The storage of 2GB internal and 2GB with the SD card is sufficient in WMA mode but maybe a little low if you were using it in 24 bit mode which i noticed has been addressed with the LS 11 model.The LS 10 is also extremely easy to use which is another bonus. Even though i have never used a different recorder to compare with, all i can say is i am extremely happy with mine. Robin you are absolutely brilliant! Fixed a bad link that's been here all along. I want something simple to record harp playing on and wondered if the MS11 would fit the bill. I understand the harp is a difficult instrument to record and was concerned that the bass capability on the MS11 may not be good enough. I'm not expecting studio quality recordings but would like to achieve a reasonably good quality recording that most people would find acceptable. I have also looked at the Sony PCM-50 but it seems a bit expensive for what I want to achieve. Any advice would be welcome. If you are talking about a concert harp, I believe they radiate sound in all directions and need to be miced at a moderate distance in a good room, using some standard topology like XY. (I'd use spaced omnis since that's how I work.) If you have a poor room then you'll want to mic closer and use directional mics, to get less of the room sound in the recording. Do a search and I am sure you will find good advice! If you want to try recording a harp using the built-in microphones of a small recorder, you are already handicapped. I would prefer the LS-11 since it has a wider and clearer stereo field, due to the cardioid patterns. Put it on a stand and listen by ear with sealed cans as you move it about the harp. Find a nice position and go to it. Remember that you listen with the ears in your head and your head is no bigger than a basketball (probably). That means a proper stereo recording of one instrument doesn't entail widely spaced mics. As well, you hear what the room either allows or creates, the instrument is never heard without the room's influence (unless you're outdoors, where there's wind and motorcycles etc). Further, the instrument sounds entirely different to the player and the audience. If you record closely you'll hear something more like the player hears. Do you want to record the audience's experience or the player's? You have to make that decision. I've seen recording setups involving several styrofoam heads, each with some sort of enclosed mic. Placed in an environment in audience positions, then mixed appropriately...concept was to closely approximate real audience experience. What (inexpensive) mics might work well that way way with an Oly LS10 and a mixer if some sort (and what simple mixer would do the trick)? Ah yes, the Kunstkopf or dummy head method. This is very easy to achieve and needs no special mixing. You simply require the head itself and two small condensers, which are easy to obtain from many different suppliers (in all price brackets). The recording is binaural, meaning that the left mic records from the left dummy ear and feeds the listener's left ear; ditto the right. Headphones are required so their is no channel crosstalk. The experience varies depending on how well the dummy head models the listener's head. Look up HRTF if you want a more complex answer! I am looking to upgrade my external Audio Technica Stereo condenser microphone to the Olympus LS-11. I am considering using 2 Sennheiser e914 microphones. Would they work with the LS-11? Some reports mention that the phantom power can be turned on to support this type of application and others say they need some sort of additional power supply in order to operate. Does anyone use external microphones that don't require a battery that work well with this unit? Microphones are a HUGE topic I have avoided for too long. So you'll be pleased to know I have started on a series of articles, the first one published today. Stay tuned for answers to your power questions. But in short... you will need separate phantom power units for those microphones to work with the LS-11. The power supplied by these units IS NOT phantom power (though some abuse the term), it is Plug-In Power (PIP). I am looking forward to your articles. Would you be so kind to leave a link here so i may find them easily? I am excited to hear what type of microphones i can upgrade to. Simply go to the home page of my blog and check out the new articles. Part 2 was just published! I am planning to buy a recording device to be used for conducting interviews (insisting on the quality of the sound as the main issue of my project which is based on the recorded sounds). I an confused between Olympus LS-11 & LS-14? Well, I don't blame you for being confused. Olympus have released a fair number of models and do little to differentiate between them. I haven't used the LS-12/14 series, which is very slightly larger and very slightly lesser in sound quality, according to measurements others have done. But they add a fair number of features, mostly oriented towards musicians (chromatic tuner, metronome, playback speed control, overdubbing). Plus a pre-record buffer, which can be really handy. The LS-14 also has a third omni microphone, permitting greater control over what gets into the recorder in the first place. So, it's a trade-off between all those features and the 2dB greater pre-amp noise.